A unique boxing tournament requires special rules. In the World Boxing Super Series there will be an additional fourth judge whose scorecard will be used if the main three judges deliver a draw result. In the case of an Ali Trophy bout ending in a draw on the three official judges’ scorecards, or ends as a no contest or no decision and the official master-scorecard, containing the three official judges scores does not determine a winner, the scorecard of the fourth judge will be added to the master-score-card to determine who advances to the next round of the tournament, or wins the Muhammad Ali Trophy. If two of the now four judges score the bout in favor of one Boxer A, and at least one of the other two of the four judges score the bout a draw, such result shall be considered that Boxer A shall advance to the next round of the tournament. 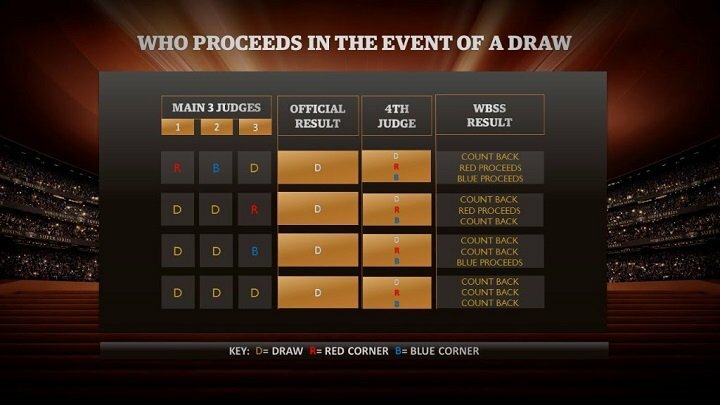 If the bout still remains a draw, after adding the fourth judge’s scorecards to the master-scorecard result, then the World Boxing Super Series will use the ‘Count Back’ method in order to determine who advances in the tournament. The Count Back method is a ‘sudden death’ method of scoring using the three official judges’ scorecards to determine who advances. Beginning with the scorecards for the 12th or last round that occurred, the boxer who won that particular round on at least a majority of the three scorecards will advance. If the bout was scored evenly in the 12th round or the last round that occurred, the advancing boxer will then be determined by who won at least a majority of rounds in the preceding round. If neither boxer won the next to the last round on at last on a majority of the three official judge’s scorecards, each preceding rounds scorecards will be examined until a round where one boxer was declared the winner of that round on at least the majority of the three officials’ scorecards. ‘Instant replays’ will be used to help assess controversial situations.